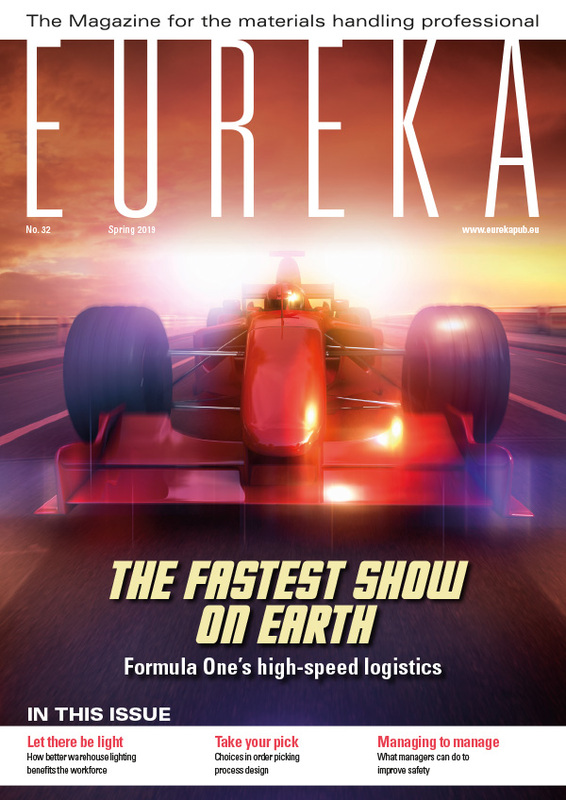 High-speed logistics challenges in the world of motorsport. Motorsport, whether it’s racing or rallying, on two wheels or four, is popular across the world. The highest-profile series, the Formula One Grand Prix World Championship, visits every (inhabited!) continent on the planet. Planning and managing the logistics is quite a challenge – and not for the faint-hearted! Long-time racing fan Ruari McCallion has a scout behind the scenes with help from Rocla Rus. What takes 50, 80 or even more forklift trucks up to three weeks to put together and less than 24 hours to take apart? It’s the infrastructure for a modern-day F1 GP (Grand Prix). Looking after the logistics involved in getting the show together, on time, and maybe thousands of miles away from the previous event is a job only for the brave. Konstantin Titov, Managing Director of Rocla Rus, Russia’s importer of Cat® forklift trucks, is perfectly placed to comment on the Russian GP’s inner workings from one of the forklift truck supplier’s viewpoint. Once upon a time, Formula One racing teams would turn up at a racetrack, unload the transporter, or trailer in the case of the smaller set-ups, have a cup of tea and then go racing. A couple of grumpy mechanics in oil-stained overalls kept the wheels turning while a girlfriend or benevolent sister recorded the lap times. The determined young racing driver might also double up as truck driver, especially in the smaller outfits. Whether that nostalgic picture was ever true or not, it certainly isn’t the case today. The Formula One Grand Prix World Championship series is a multi-billion US dollar enterprise, with hundreds of team members monitoring data from sensors on every component of every car. At the circuit, skilled technicians in crisp uniforms sit at banks of computers in spotless facilities so sparkling that one hesitates to describe them as garages or workshops. They look more like operating surgeries. By the time the red lights go out on a Grand Prix Sunday, the purpose-built circuits themselves are in their party clothes, with Rolex timing gantries, active LED advertising displays and giant hoardings at every TV-friendly vantage point. 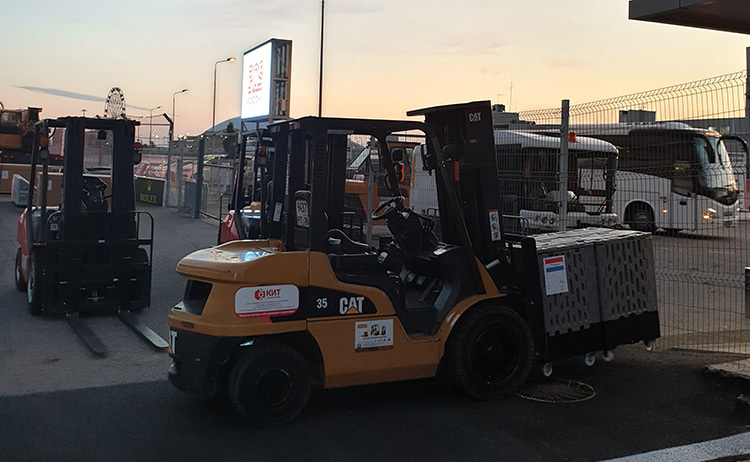 Cat® forklifts are a familiar sight at the Russian GP racetrack. Getting the show to the racetrack – and away in time for the next event, which may only be a week away – is a significant logistics challenge. DHL, the Formula One Management (FOM) global logistics provider, works with local companies at each GP to bring everything to life. 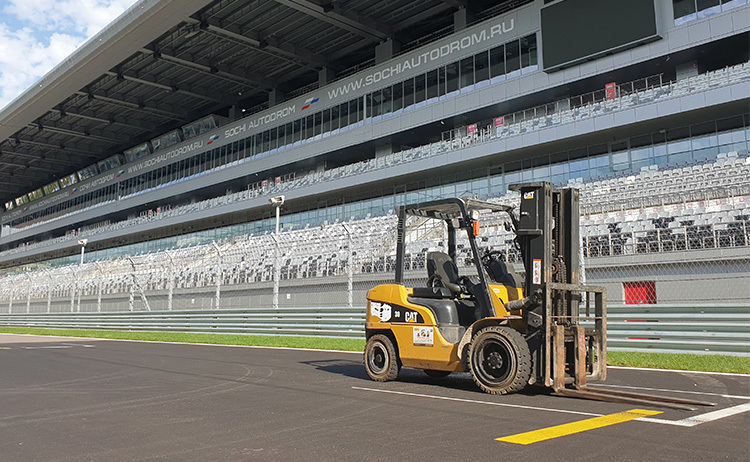 A Rocla Rus dealer, KIT LLC, provides support to Rosgonki, the Russian GP organiser, with the rental of materials handling equipment at Sochi Autodrom, the home of the Russian Grand Prix. The numbers involved behind the scenes are pretty staggering. A forklift truck fleet of at least 50 – maybe 80, or even more – is required on the site, depending on the needs of the teams and the season scheduling. The 2018 Russian GP was held on 30th September, two weeks after the Singapore GP but only seven days before the race in Japan. Putting everything up and getting it back down again imposes a lot of time pressures. Eagle-eyed viewers watching on TV may have seen the materials handling experts starting to demount the Rolex timing gantry while the presentation ceremony was still under way. 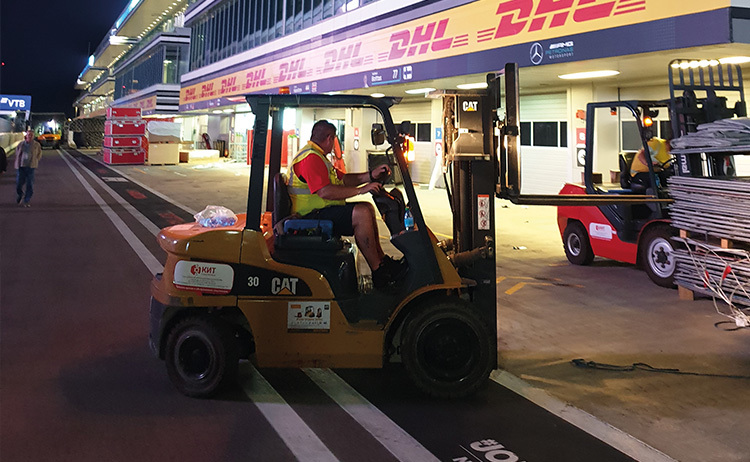 Lift trucks servicing the needs of DHL, the Formula One Management global logistics provider. Depending on the next GP venue, some of the freight will go by sea or by land; there is not just one package of equipment moving from place to place. With up to 45 days’ lead-in, less expensive items can be duplicated or even triplicated and, of course, if events are close together – the British GP and German, for example – trucks can carry equipment by road. But at the very least, there will still be a few Boeing 747 cargo aircraft in the air, transporting containers full of advanced, highly technical equipment, which will be ruggedised but still require sensitive handling. The cars themselves, plus their transmissions and engines, will usually go by plane. The Russian GP required nine cargo aircraft in 2018. At the track, the materials handling fleet available to the organisers – Rosgonki, in the case of the Russian GP – will be made up of quite a variety of vehicles: golf carts, low-frame trailers, compact lorries and scooters, along with 3-, 5-, 7- and 10-tonne lift trucks. Cat® trucks were represented by three-tonne machines. They can be seen around the paddock zone, at DHL’s disposal and to service the teams’ needs. In addition, there will be tow trucks and telescopic loaders placed strategically around the track, ready to assist cars that may have crashed or spun off and are unable to make their way back to the pits under their own power. The pit and paddock complex itself is a combination of high glamour, almost garish showbusiness in the entertainment, office and meeting areas, and near-paranoid ultra-high security where the cars, their engines, transmissions and technological components are unloaded and stored, in the heavily-guarded pavilions at the back of the pits. The biggest forklifts unload the containers from the aeroplanes onto low-loaders. The big containers have smaller containers inside them, holding the individual teams’ cargoes. Even a smaller team, like Sauber, will carry around 25 tonnes of equipment and spare parts to each race. Larger organisations, like Red Bull and McLaren, may carry twice as much. Scores of containers, of different sizes and weights, will be used by each team. The competition in F1 is international, with teams nominally from France (Renault), Austria (Red Bull), Germany (Mercedes), the UK (McLaren and Williams), Canada (Racing Point) and the USA (Haas F1), as well as the Swiss Sauber organisation and, from Italy, Toro Rosso and the legendary Ferraris. Getting them and their equipment together in time for the race weekend and then back home again could be even more of a nightmare if they were all actually based in those nominal countries of origin. In fact, the first six are firmly UK-based and Haas F1, while being headquartered in Kannapolis, North Carolina, USA, has a forward base in Banbury, England. Because seven of the teams are based in England, two in Italy and one in Switzerland, DHL has established two co-ordinating centres: in London and in Munich. The teams transport their freight and equipment to these centres, where onward carriage becomes the responsibility of the logistics provider. Even the smallest teams carry around 25 tonnes of equipment and spare parts. The 2019 season begins with the Australian GP in Adelaide, South Australia, on March 17th, and concludes with the race in Abu Dhabi on December 1st. It comprises 21 races – the equal-highest ever in a season. One can imagine the logistics managers of the teams, of the host circuits and of DHL, the logistics provider, taking a deep breath before sitting down with their personnel to plan for the year. Intralogistics requires a lot of planning upfront. It has to function like a single, well-oiled machine. Contractual obligations are very strict; whether the race is in their backyard – Monza for Ferrari and Toro Rosso; Silverstone for the British-based teams – or on the other side of the world, and whether the trip is entirely by air or includes highway and sea transport as well, there is simply no room for error. Rocla Rus is proud to have provided support and service to Rosgonki, the Russian GP organiser, and to DHL, FOM’s global logistics partner. They are all wound up and ready for the green flag in Adelaide that will open the 2019 season. The head office of Rocla Rus is in St Petersburg, Russia. It has 26 dealers across the Russian Federation and Confederation of Independent States. Its payroll totals 40 people.